If you like Mexican food, fresh vegetables, and peppers, you are going to really enjoy this! Fresh corn is now in the market but frozen will work well also. 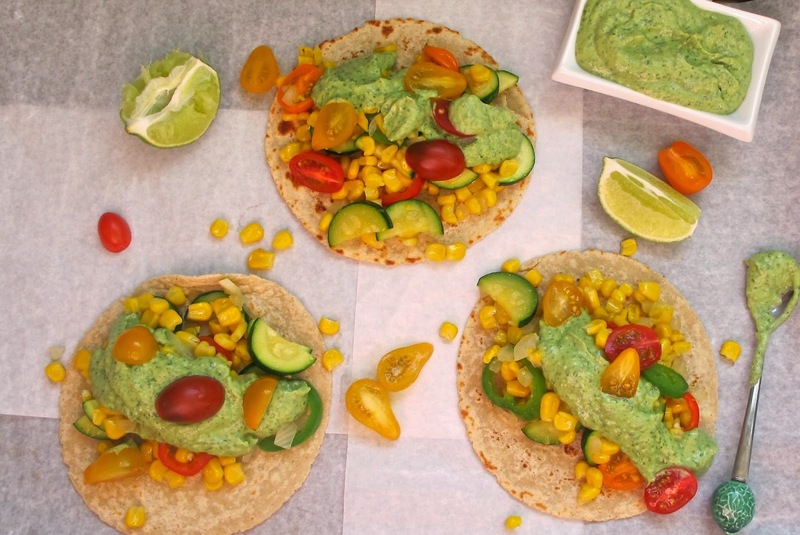 The avocado crema is also good as a tortilla dip or slathered on a sandwich. I just saw Bake using it as a dip for grilled shrimp. Combine cilantro, garlic, green onion, and sugar in a food processor until finely chopped. Add sour cream, vinegar, avocado, lime juice, salt and pepper, blend until smooth. Adjust seasoning to taste, more sugar, lime juice, salt or pepper, as desired. In a large saute pan over medium heat olive oil and add onion, cook until soft (about 5 minutes). Add corn and zucchini, cook about 2 minutes, stirring constantly. Add peppers and cook about 1 minute. Remove from heat and add 1/2 of tomatoes. In a large non-stick pan or over gas burner, heat corn tortillas until warm. Remove and spoon in vegetable mixture, top with avocado crema, and tomatoes. Serve with additional avocado crema and lime on the side.